Why does burnt skin peel off? Part of the show QnA - Should you pee on a Jellyfish Sting? Why does my sunburnt skin flake off rather than turn me into a beautiful bronze goddess? Jane - Well I think that's a great question but we're all thinking about the beautiful bronze goddess rather than the flaky person, aren't we? Let me take the end of the question first because I think there is something aesthetically very pleasing about even toned skin and perhaps not too pasty. In this country where we don't always get a lot of sun, as we've just been hearing, that little bit of a hint of colour to the skin is regarded as being attractive. But I think the quickest way to being a beautiful bronze goddess is probably to have a spray tan. So I'll just put that one in first. But the sunburn business, very important. So sunburnt skin is bad news. That means that you've had enough damage from ultraviolet light to cause damage to your DNA, and sunburn is the process that the skin is going through to try and repair the damage that's actually happened from the ultraviolet light. Chris - So there is inflammation in the skin after you've been hit by that deluge of UV from the sun? Jane - Yes. So as the skin tries to recover from that damage, it's inflamed and then as inflammation settles you get the peeling just like you do if you have a scratch or some other sort of inflammatory process in the skin. Eczema, psoriasis, that are common skin disorders, they both have inflammation. They both have flaking. Jane - Yes. You do do a little bit of damage every time you go out into the sun, but if you are definitely pink and burnt then you've done a lot more damage and there's a lot more recovery to happen. Chris - So is the best approach to do a sort of graded exposure then? you have a little bit of sun exposure and go a little bit brown, and then a bit more exposure and go a little bit more brown, if you're seeking to adapt your skin to sun exposure so you don't ever burn but you just accrue a sun tan? Jane - That would be the perfect process. 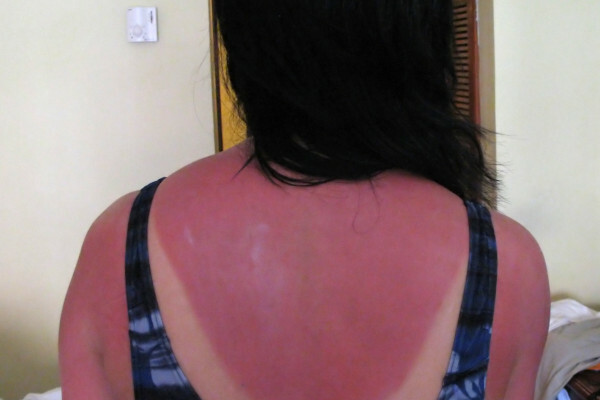 So on holiday, it's always best to never get burnt. And you have to know your own skin and the sun and the the intensity of the sun quite well to know exactly what that means. But if you can avoid getting any pinkness to your skin when you go out in the sun, if you go to the med, just have enough sun exposure to get a little bit brown then you'll be doing the best you can for your skin. Previous Why is my hayfever so bad this year? Next What is a jetstream? How much of our body do we need to survive?